He's labeled 'anti-Semitic' and a 'white supremacist' amid a battle for control of the party and fears of losing the Senate majority. Establishment Republicans aligned with Senate Majority Leader Mitch McConnell have launched a concerted effort to personally attack Steve Bannon in the hopes of blunting his impact in Republican primaries. Bannon’s effort – a loosely organized political machine of hard-line Republican primary contenders and media organs united by their loathing of McConnell as an icon of traditional Republican politics – has prompted eruptions in once-sleepy races and on Capitol Hill, with retirements and acrimony following. The fallout is now a threat to the party’s narrow 52-seat majority in the Senate, as prominent Republican senators decide to retire rather than face the furious political storm, especially after Trump was unable to pull a McConnell ally to primary victory last month in a special election for Senate in Alabama. Sen. Jeff Flake, R-Ariz., announced Tuesday that he would not seek re-election next year, one week after Sen. Bob Corker, R-Tenn., had done the same. Both men, no longer accountable to Republican primary voters, have embraced higher-profile roles as critics of the president, with Corker repeatedly calling for “day care” to step in and control him. The Senate Leadership Fund, a PAC aligned with McConnell, has also stepped up its effort to embarrass Bannon. On Wednesday, the PAC’s Twitter account mocked Danny Tarkanian, a frequent candidate now challenging Sen. Dean Heller, R-Nev., for suggesting that they both pledge to oppose McConnell as majority leader. The leadership fund tweeted a 2016 headline from the New York Daily News – “Anti-Semitic Trump campaign CEO Stephen Bannon not a big fan of ‘whiny brat’ Jews, ex-wife says” – with space for Tarkanian’s signature. “Here’s another pledge for @DannyTarkanian to sign,” tweeted the leadership fund. After seeing what the leadership fund tweet to Tarkanian on Wednesday, a confidant said Bannon responded with laughter, as he has to other attacks on his character in recent weeks. 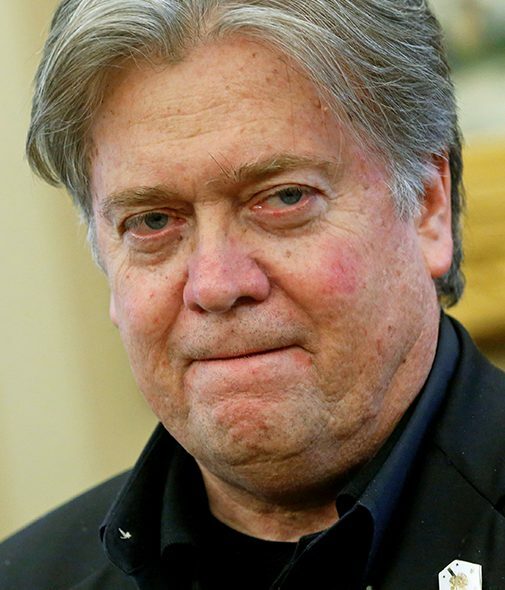 Bannon’s circle argues that the attacks using the contents of his divorce proceedings, or claims of racism, are unlikely to do new damage to his reputation, since he has been targeted in the past along those same lines by Democrats, and even in a “Saturday Night Live” caricature as an angel of death. Advisers also note that the attacks elevate Bannon’s profile, which could help carry his anti-establishment message. “The personal attacks are the last vestige of losing campaigns,” said another Republican close to Bannon. In an email, leadership fund President Steven Law said he expected Bannon to become a liability for any insurgent candidates he supported in 2018. “But his real impact would be felt in general elections, where Bannon’s well-documented, toxic views and alt-right paper trail could become a liability for candidates who are perceived as closely tied to him,” Law said. According to public polling, neither McConnell nor Bannon are in good standing with voters. In an April poll conducted by Quinnipiac University, one of few to ask voters about Bannon, just 11 percent said they viewed him positively, and 45 percent said they viewed him negatively. The numbers were better among Republicans, with a nine-point favorable margin. McConnell’s polling among Republicans, meanwhile, has tumbled since the start of the year – a fact Bannon has used to his advantage. 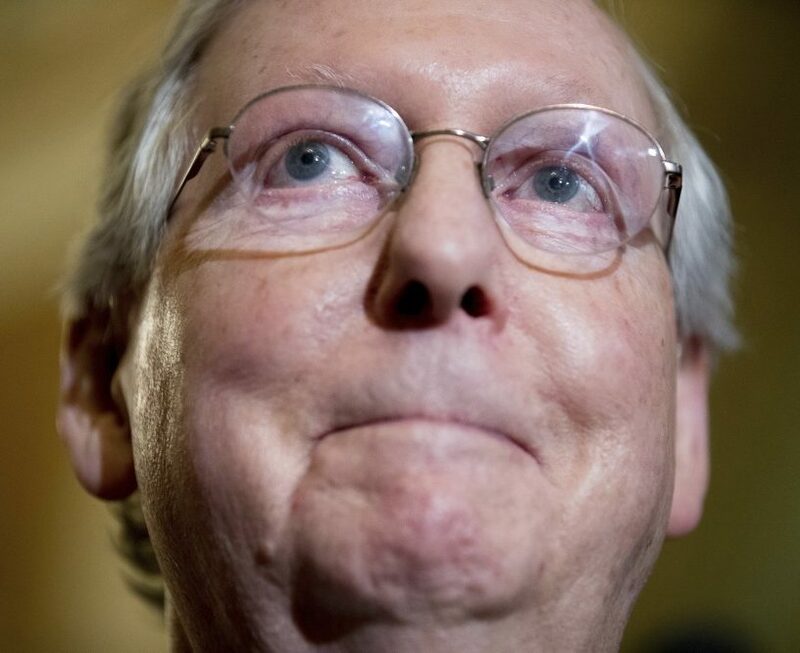 On Tuesday, Bannon’s Breitbart News reported that the Harvard-Harris poll found 56 percent of Republicans in favor of dumping McConnell as leader. That same day, at a media roundtable organized by the Heritage Foundation, a reporter for Breitbart asked members of the House Freedom Caucus to respond to the poll number. “It was that high?” scoffed Rep. Matt Gaetz, R-Fla.
Senate Republicans, meanwhile, moved quickly to demonstrate that the party’s agenda is moving forward, and that relations with the White House are smooth. On Wednesday, 24 hours after Flake resigned, Ivanka Trump appeared with Republican senators to pitch a child tax credit that she has lobbied to include in any tax cut bill. And outside the Senate, there was little worry that the intra-Republican brawls were slowing the party’s agenda. On Tuesday night, both Flake and Corker joined all but two Republicans to overturn a new Consumer Finance Protection Bureau rule that made it easier to sue banks, a priority of the U.S. Chamber of Commerce. Dan Holler, a spokesman for Heritage Action for America, said Flake remained on board with conservative priorities, no matter what happened with Trump.